The ground penetrating radar system works by sending a pulse of energy into a material such as concrete and recording the strength and the time required for the return of any reflected signal. A series of pulses over a single area make up what is called a scan. Reflections are produced whenever the energy pulse enters into a material with different electrical conduction properties or dielectric permittivity from the material it left. The strength of the reflection is determined by the contrast in the dielectric constants and conductivities of the two materials. GPR is a tool for indirectly looking at underground objects such as gravel and sand layers. The information or data received by GPR is like an x-ray or map of the underground. GPR uses electromagnetic waves like radio waves, which have a longer wavelength. The wavelength is the fundamental difference between the forms of electromagnetic energy. Non-destructive – Frequency waves make no damage on the subsurface, environment or surrounding people. Disturbance free – Makes little noise and doesn’t bother surrounding people. Easily deployed – Multiple size options that are user friendly, so it can be stored, moved and used almost anywhere. Rugged – Construction is durable and designed to endure the everyday riggers associated with its applications. Upgraded system – Similar to having a test trench or boring along the whole length of the project without digging. Eliminates Waste: Points out areas to test pit or sample bore. A ground penetrating radar system is made up of three main components: A control unit, an antenna and a power supply. The GPR energy pulse is reflected back to the antenna and energy also keeps traveling through the material until it either dissipates or the GPR control unit has closed its time window. The rate of signal attenuation varies widely and is dependent on the properties of the material through which the pulse is passing. These pulses are then recorded on a screen to form the differences in material. The GPR operator will note the location of a target so that it can be avoided; a process called utility locating or utility mapping. These situations will require the operator to use GSSI GPR processing software, which applies mathematical functions to the data in order to remove background interference, eliminate hyperbolas, and calculate accurate depth. Proscan Subsurface Imaging has been in business for over 7 years and we aim to exceed our client’s expectations. If you would like to know more about the concrete GPR services we offer, do not hesitate to visit our offices or fill out our online quote request. Is GPR a safe testing device? Yes. GPR uses only 1% of a regular cell phone signal. GPR systems work by sending a pulse of energy into a material via an antenna. A computer records the strength and time required for the return of any reflected signals. Subsurface variations will create reflections that are picked up by the system and stored on digital media. How deep can GPR penetrate to locate targets? Depending on a wide variety of factors such as ground density and consistency, GRP can locate objects up to 5ft underground. GPR can be used to locate any object that has a different composition than its surrounding materials. 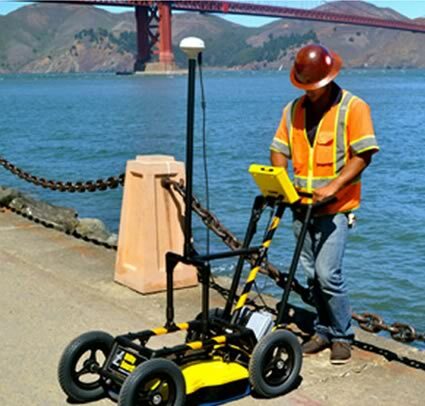 Can GPR be used with GPS? Yes. GPR can integrate with most GPS systems. How accurate are the results when using GPR? The GPR system is very accurate and can pinpoint exactly where an underground object is located.